Incandescent light bulbs are extraordinarily inefficient. Of the energy they consume, just 10% emits as visible light and a whopping 90% emits as waste heat. According to ENERGY STAR®, if every household in the United States changed one incandescent light bulb for an ENERGY STAR rated bulb, the annual energy cost savings would approach $600 million and greenhouse gas emissions would drop by 9 billion pounds. This would be like taking 800,000 cars off the road. ENERGY STAR-rated light bulbs save energy by using 75% less energy and by emitting 75% less heat, thus reducing home cooling costs. These bulbs include compact fluorescents (CFLs) and light emitting diodes (LEDs). When buying, look for the ENERGY STAR logo. CFLs come in various shapes and fit most incandescent bulb lighting fixtures. CFL light color varies; for the most incandescent-looking light, choose 2700-3000K CFLs. CFLs last six times longer than incandescent bulbs, but have drawbacks—they are fragile, they take as much as a minute to come to full brightness, and they contain mercury (a heavy metal and toxic pollutant), classifying them as household hazardous waste. Spent CFLs must be recycled; see Earth 911 for local CFL recycling information. Mercury-free LED bulbs last 22 or more years in a typical home, are more durable, come on instantly, and are more energy efficient than CFLs, but they are also cost more up-front that CFLs. 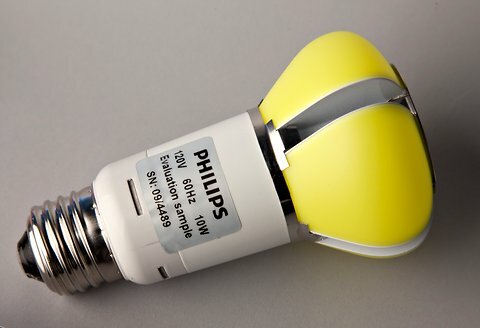 A new Phillips 60 watt replacement bulb arriving in stores in 2012 is most like an incandescent bulb in brightness and color, lasts 25,000 hours and uses 9.7 watts to produce the 60-watt equivalent luminosity. Dimmable CFLs have limitations: they are more expensive, have shorter lifespans, require special dimming switches, and multiple bulbs on the same dimming switch may not have differing brightness levels. Dimmable LEDs are also a bit more expensive but do not share the limitations of dimmable CFLs. This post does a good job of explaining the ecological impact of various bulbs, but I’d be interested to know a little more about the personal cost-efficacy of Energy-Star light bulbs and appliances. The LED bulbs last 22 years and cost more up-front; how long in years do the CFL bulbs typically last? How much more do LED bulbs cost? How much can you expect to save over the lifetime of the bulbs in energy cost and by not needing to replace the bulbs as often? Your other post on Energy-Star audits was great, but I’d love to know more. I’ve done a bit of research on this issue, but it’s nowhere near comprehensive. Technology changes so quickly that what I know is probably outdated, anyway. Yes, I would love to know more too. I am considering replacing 60 ceiling can lights with LED at a cost of $3,650.00. Ideally, I want to replace it with a standard base in case the technology changes yet again. The new Phillips bulb looks promising. I found it very difficult to source articles online that were current—the limitations of internet search. The top searches brought 2 year old, often conflicting articles, many from online retailers. I am suspicious of what manufacturers and retailers write about products they sell, especially unfamiliar online retailers. This is why I generally look to independent labs for their take. The articles I found while searching for current information about ceiling mounted LEDs mentioned that the bulbs they tested did not put out enough light to light a room with a10 foot ceiling; not promising from my perspective. I am also very concerned about dimmers and mercury, so I am not jumping into CFLs for my ceiling. I use limited CFLs in other parts of my home, but not in the ceiling. Before I spend the big bucks, I need to see a demonstration home and I am putting off the decision until at least the new Phillips bulb hits the market. When I find that demo home, I will take pictures and will report results in a new post. Meanwhile, I will continue my search for independent lab assessments. Just picked up some CFLs today at Costco. The LEDS were about 7x more expensive. I hope they eventually come down in price. Yes, as an emerging technology, LEDs are expected to come down in price. They are supposed to last 22 years though, making them the best financial solution eventually.